My Grandfather was enlisted with the Canadian Artillery during WW 1 and his last rank was that of a Battery Quartermaster Sergeant. I have what I think are his stripes, dogtag, etc but am curious about his actual stripes for his BQMS rank. I have Sergeant stripes but no patch for the crown but rather metal "Kings" crowns. Is it possible or likely that he wore the stripes and crowns on his sleeve to designate his rank? I've attached a picture of the stripes and crown. 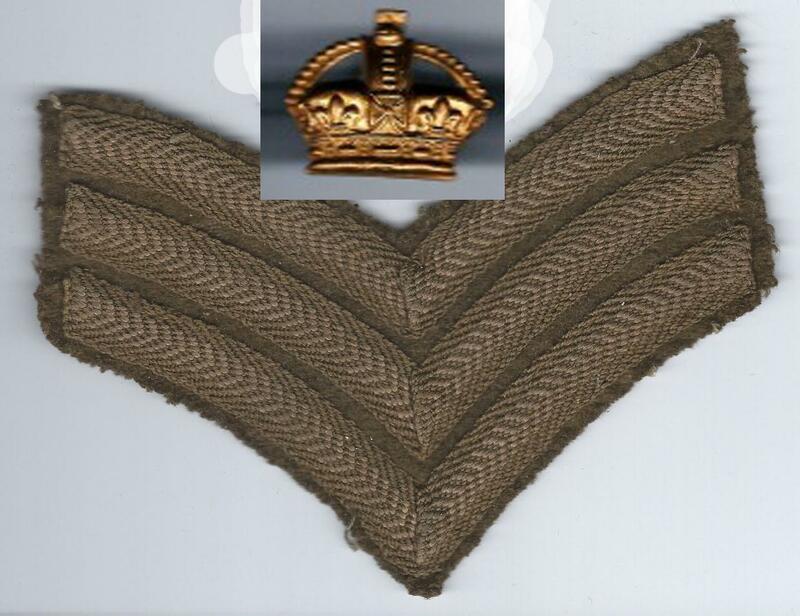 In the Great War, a BQMS would have worn three stripes, point down, with a crown above them. This was one of the few appointments which the Canadians classified as a 'staff sergeant' but, unlike later American practice, did not use reversed chevrons and so on to distinguish the specialist staff from those in a regimental/battery chain of command.